Looking for a new job can be a full-time job, so make sure you have the right people working with you to find the best results. 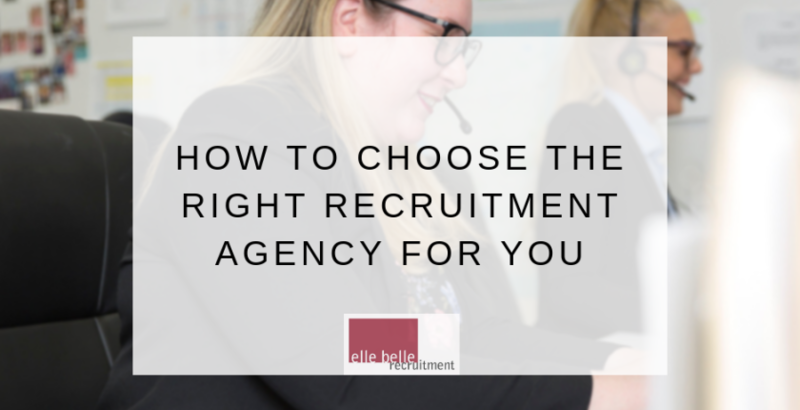 A recruitment agency can save you time and resources when it comes to your job search but making sure you have chosen the right agency is an important step in the process. Research the website – probably an obvious one, but make sure you align with the company values and mission statement and try to understand how they operate, do they give back to the community for instance? Is this something that is important to you? What type of clients have they worked with before? Are they mainly large organisations or small and what are you suited to, a big or small business? Does this align? Do you have a specific industry you would like to move into? If you are more specific about the type of industry you would like to work for, look for agencies that specialise in a certain area e.g. IT or Digital Marketing. Location – where is the agency based and where are most of their clients located? There’s no point meeting with an agency that’s over an hour away as most likely (but not always) clients will be in proximity to that area. Give them a call! It doesn’t hurt to have a quick conversation with a consultant to understand how they can help you as a candidate. Contact us on 03 9553 4436! Once you have narrowed it down, register with a few agencies that line up with your needs, and keep looking yourself. The more eyes looking for you, the better your chances are of landing that perfect dream job!